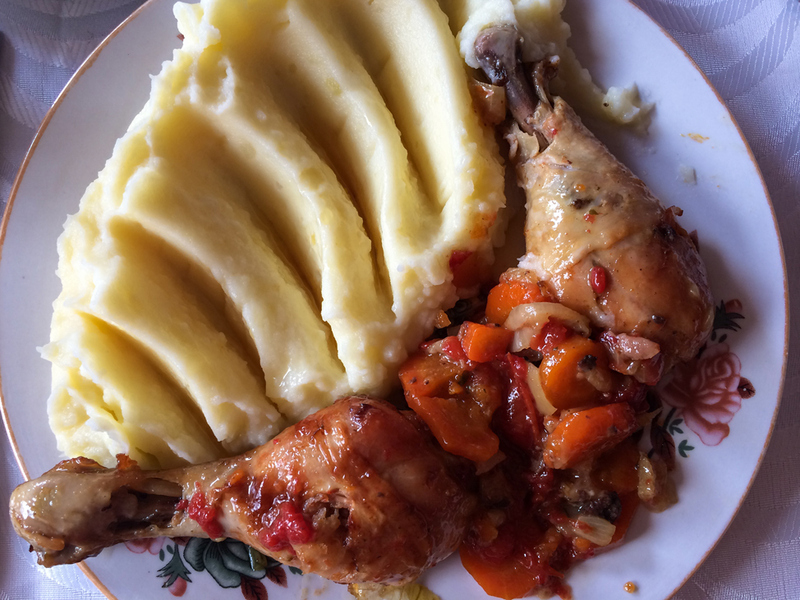 Before we arrived in Romania my idea of their typical cuisine was meat and potatoes. I expected that vegetables were pretty much non-existent in Romanian food and finding a good salad would be a challenge. I was half right. Meat is definitely a big part of Romanian food, and they really know how to do meat right. Starches are served with every meal. Salads were a challenge, at least ones without cabbage in them, but not impossible to find. 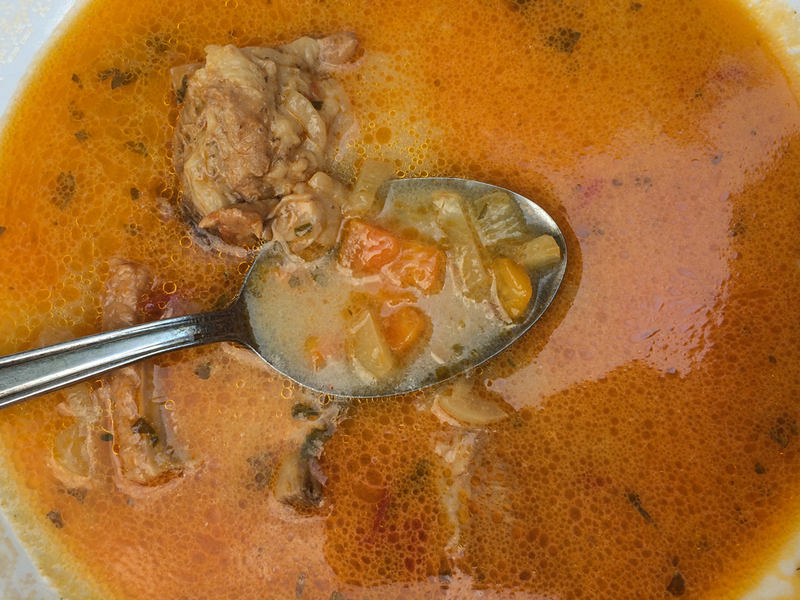 Bean soup (pictured left) is a staple in Romania. It is prepared differently in various regions throughout the country, but the concept is similar: stick-to-the-bones-soul-food. 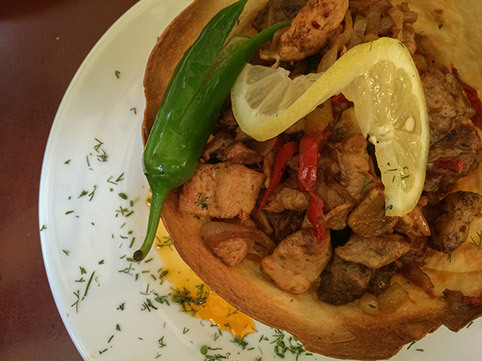 My favourite variation was in Bucharest, prepared with bacon and vegetables and served in a bread bowl. 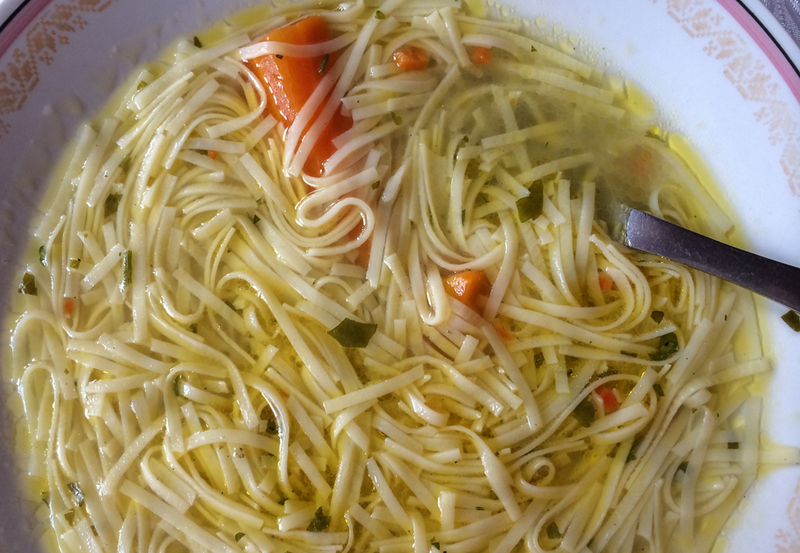 While in Sinca Noua more we savoured a chicken noodle soup and a pork rib and vegetable soup (bones still in) as a starter to every meal. The Romanians know meat, especially sausage. 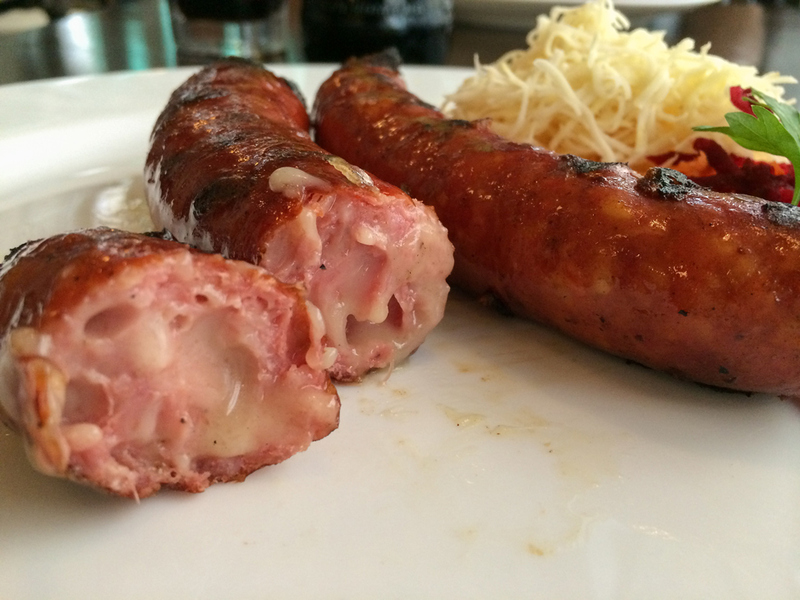 Upon visiting numerous traditional Romanian restaurants we usually found a whole section dedicated to sausages alone. 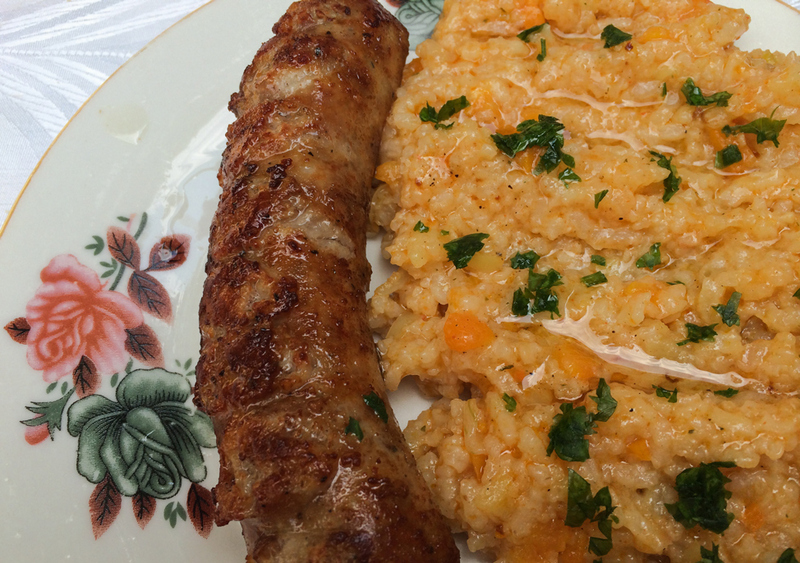 The most common being mici (pronounced michi) which is a finger sized grilled mince meat sausage, usually consisting of beef mixed with pork and sheep, and then heavily spiced with garlic, pepper and paprika. These are quite common in street food stalls accompanied with a pint of beer. 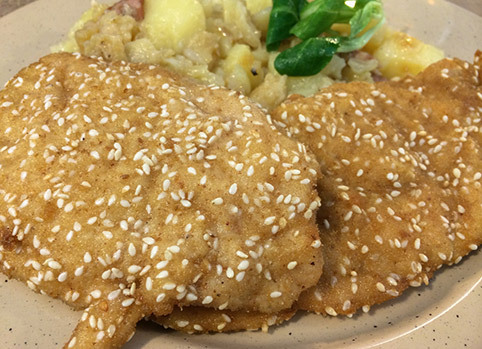 Menus will have easy items such as pork and chicken schnitzels, and for the more adventurous eaters the Romanians embrace the “whole animal” concept. We found brains, testicles and other parts of the pig on the menu and we put it to ourFacebook fans to decide which one I would try. The testicles pictured above won out – they were quite tasty but a little chewy. 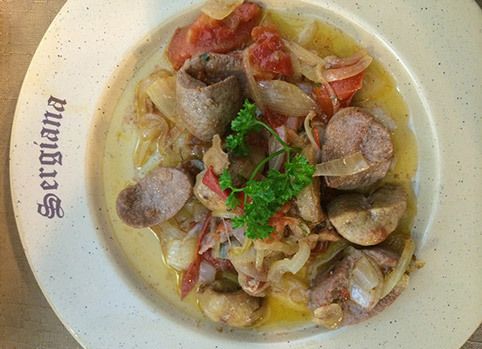 Typical Romanian food consists of a meat and a carb. 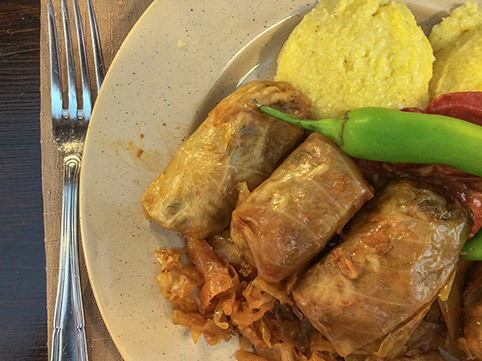 Sarmale (pictured upper left, better known as cabbage rolls) is one of Dalene’s favourite meals and very typical throughout the country and entire region. A pilaf (bottom left) with tomatoes, carrots, onions and dill, and mashed potatoes soaked in butter (bottom right) is also popular. On another occasion I enjoyed a blended grilled meat dish served in a phylo pastry bowl to absorb all the juices from the meat. Pizza is also very common throughout Romania – in some towns your only restaurant choices will be Romanian and a pizza joint. Although it is no Italy, the pie is generally cheap and tasty. The menus also have sauces on the side (tomato and spicy) and are recommended as generally the sauce is spread thin on the dough. Potatoes, polenta, rice. One thing to be aware of when ordering food in a Romanian restaurant is that main dishes do not come with sides. Peasant potatoes (pictured left) was one of our favourite side dishes and how could it not be? 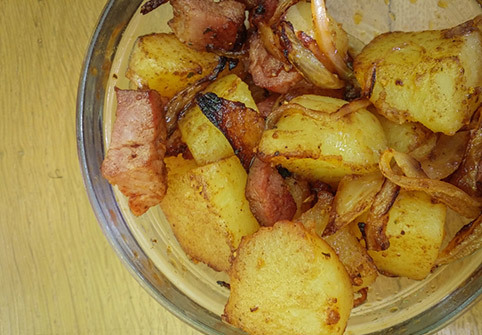 Pan fried potatoes with big chunks of bacon and onions. 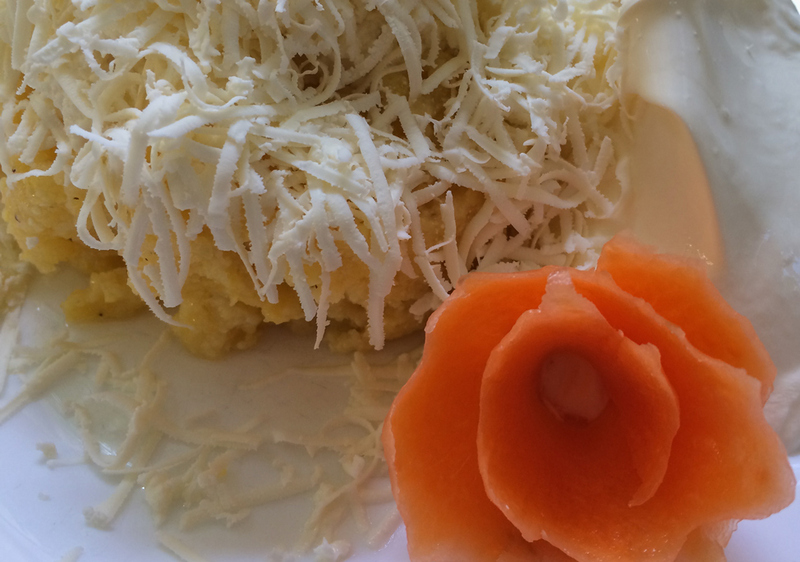 Polenta is also a very popular Romanian side dish and it is served in various ways, the most common being mamaliga, topped with cheese and sour cream (pictured top right) or with traditional cheese baked inside (middle right). One thing is for sure, ordering one of these side dishes with our meal meant that we never left the restaurant feeling hungry. Salads generally consisted of tomatoes, cucumbers, onions and or cabbage. While we ordered a salad with every meal after a couple weeks our bodies were craving green veggies. Our last city in Romania was Sibiu where we managed to find an incredible salad (bottom left). 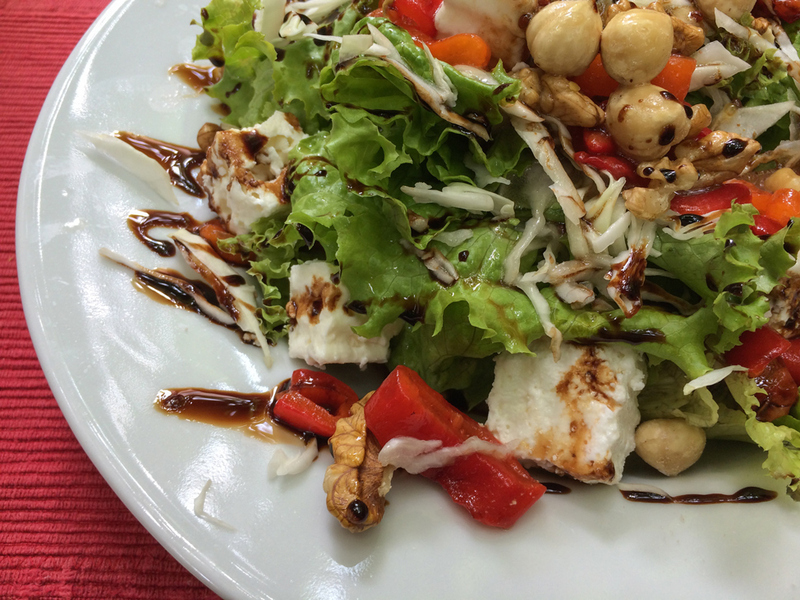 Topped with goat cheese, hazelnuts and an assortment of fresh vegetables with a vinaigrette glaze, it was a nice change from the heavy Romanian food. 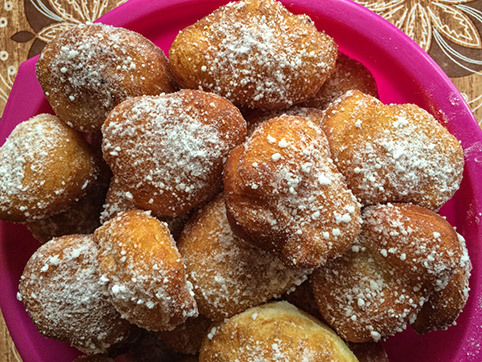 Known as the Romanian donut, Gogosi is pan fried dough tossed with icing sugar. 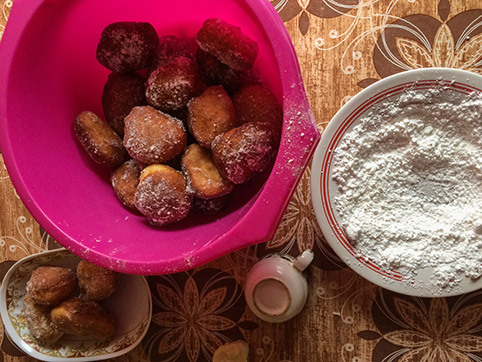 Dalene had the chance to make these with the family during our stay in Sinca Noua and learned the secret ingredient of lemon zest in the dough to give it just a hint of citrus. We had expected to see dumplings on menus as side dishes or mains, but surprisingly we only found them in the dessert sections topped with fruit or chocolate. Upon leaving Sinca Noua, our host family gave us a bag of cozonac for the journey. 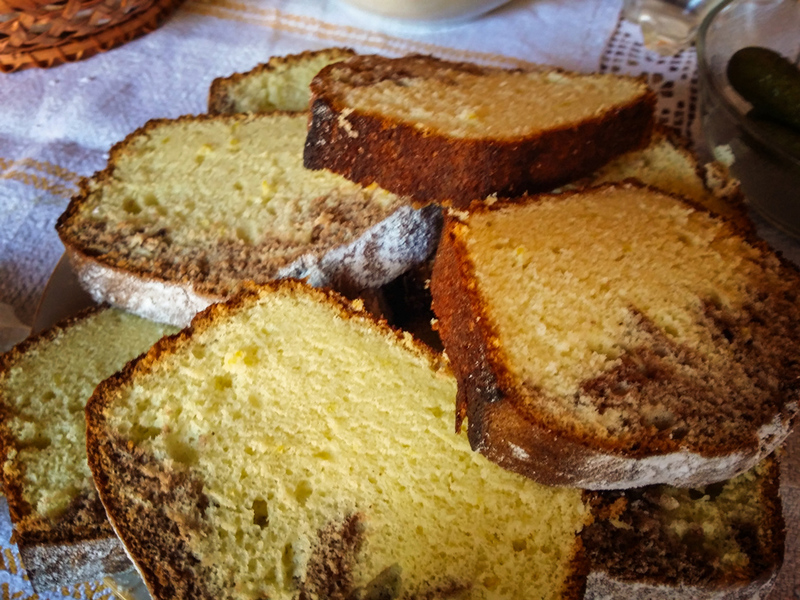 This light pound cake did not last the journey. I was shocked how much I enjoyed Romanian beer. I was expecting typical lager type brews with not much variety. Instead I found there are some very nice dark beers and best of all, very cheap. The dark beers I enjoyed were Ursus Black and Silva. Dalene enjoyed the Ursus Lemon which is a low alcohol percentage radler type beer, refreshing on a hot day. 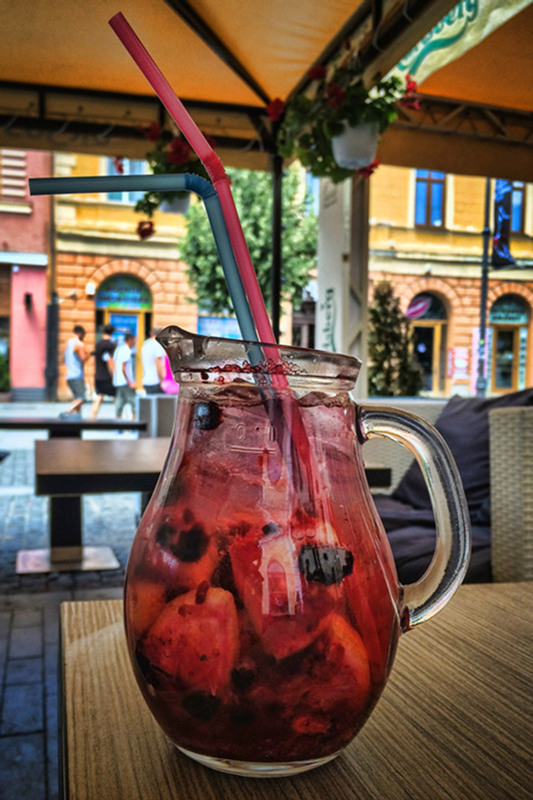 Romania has mastered the art of lemonade. Every restaurant offers it freshly squeezed and some even put there creative spins on the beverage. From basic mint to mixed berries we tried all sorts of blends. 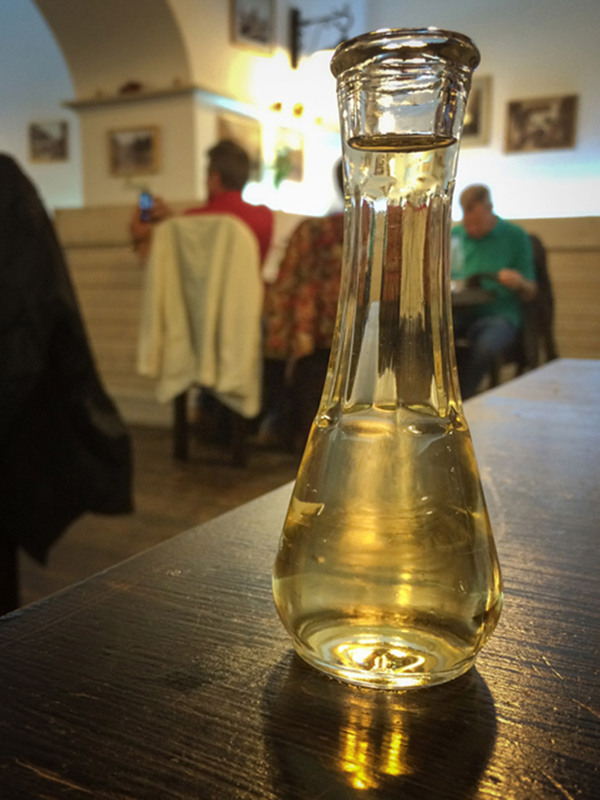 Palinka is a double distilled product with an alcohol percentage between 40-70% and is made from fermented plums. It is found all throughout Romania and we both think that this might be the secret to the long life of the Romanians. Another popular liquor, vișinată or visne is made by mixing fermented sour cherries with sugar and vodka. The quality of the drink highly depends on the quality of the fruit and it is why it is recommended that the fruit be hand picked. After the 100 days the fruit is filtered out leaving a smooth syrupy goodness. Our impression of what Romanian food would be like was not far off. Heavy, simple meals consisting mainly of meat and carbs which are intended to stick to one’s bones. We enjoyed most of the food, but were excited to find a green leafy salad after a month. ohhh wow that looks so good! We don’t get good sausages at all here in Goa. The gogosi looks incredible. I love anything like a donut! This is definitely the most appetizing—and informative—presentation of photos of Romanian food I’ve come across. 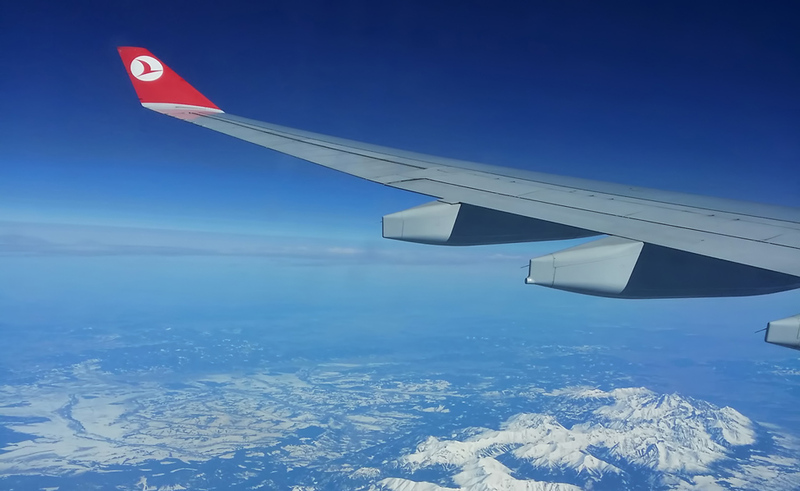 My only exposure to eastern European fare was in the Czech Republic, which is very much a meat & potatoes and not much else kind of place, so it’s nice to hear that not every country in that part of the world is quite so cut and dry. I wonder why it’s so hard to get a salad in that part of the world, though! I think Romanian food ended up being one of my favorite world cuisines after my few days there! If only I had had more time to enjoy it! Such a great orientation to the cuisine. I would be all over the Gogosi and lemonade. I think I would also enjoy a sausage-based diet. This is making me so excited to get to Romania in a few weeks! Now I’m not even too worried about being offered testicles to sample..
Romania seems a bewitching place to see and feel! I do not eat meat but I guess potato and rice will do me just fine! And that dessert seems mouth watering! Oh my, that all looks amazing. I’d maybe (read: definitely) pass on the brains and testicles, but the meat all looks fantastic. I’ve never understood people who talk about “meat and potatoes” cuisine like it’s a bad thing- those are two of the best things in the world, in my opinion! All the food looks so delicious! 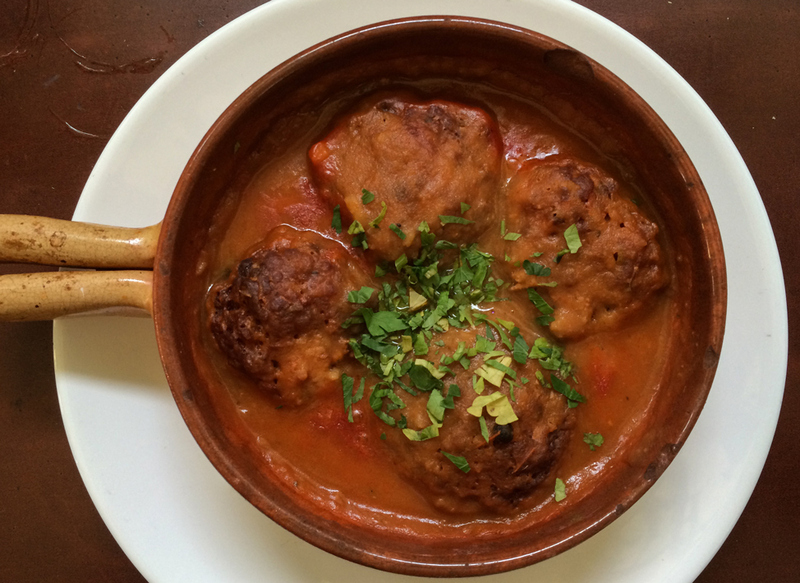 You definitely immersed yourself in Romanian food! Thanks for sharing! Hello Dalene and Peter! 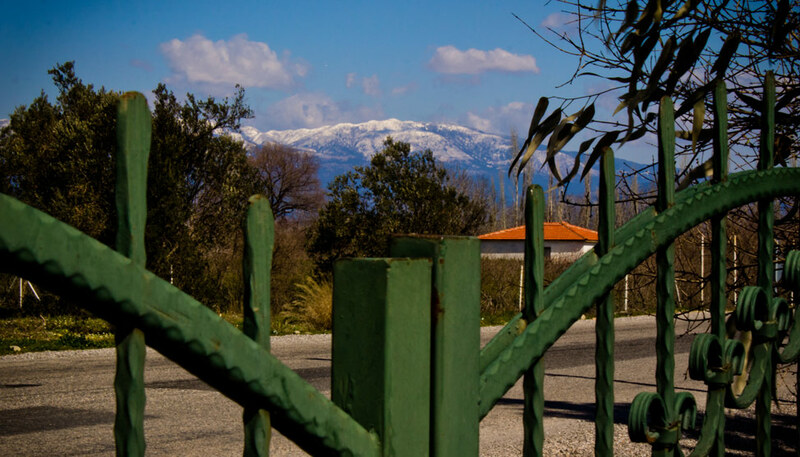 Hello to the visitors of your site! I am very happy you are in Romania! And I am glad you all like romanian food. It is very tasty, indeed. The way you describe the food is real. But we eat salads, too. Read carefully the restaurants menus! And we have a lot of dishes without any meat. Because we are orthodoxe christians and, traditionally, we are fasting a few weeks before Christmas and Easter. In that period is not allowed to eat any meat, eggs, cheese, milk or other animal products. We cat eat only vegetables, fruits and grain. 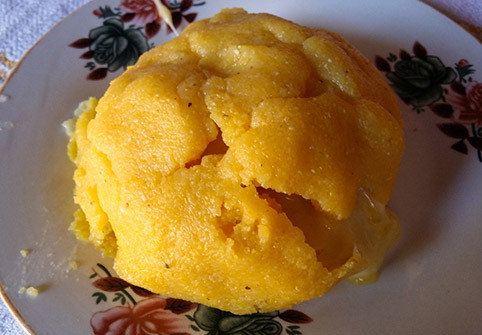 So, romanian cuisine has many vegetarian dishes. In conclusion, I invite you all in Romania to enjoy the food, the landscape (the Carpathian Mountains, The Danube Delta, The Black Sea) and to make new friends here. YUM! 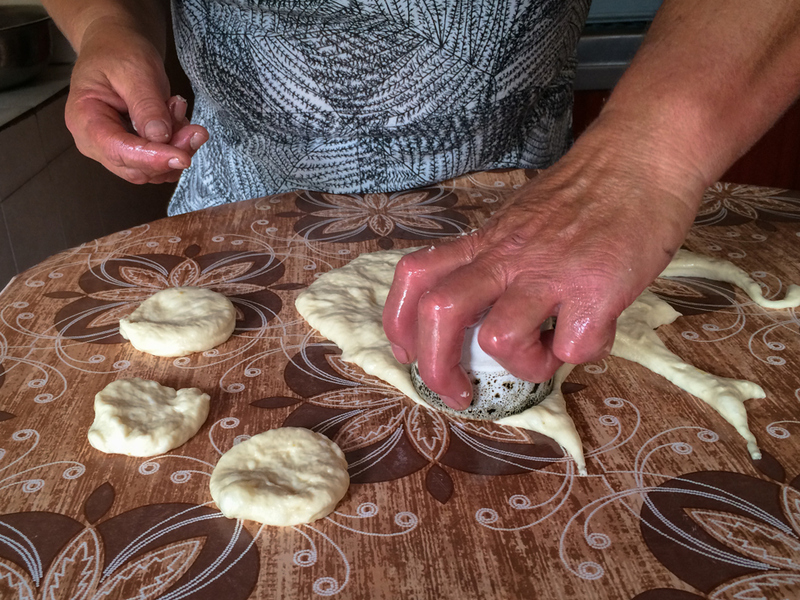 I have read a little bit about Romanian food in the past, but your photos are making me drool! All thos potatoes and sausages, I wish I could get some of that in Korea! Wow! So much meat! Eating in Romania would definitely be a challenge for a vegan like me! Don`t worry about that. Just ask for anything “de post”. This means vegan. More than half of the population here fasts at least once a week. As per Orthodox Christian rules, fasting means nothing of animal origin (well, except for honey). You will find plenty of vegetarian/ vegan dishes. Truly enjoyed your recap of Romanian food! Heading there to teach a class and I am so looking forward eating sakuska and sarmales! I forgot to mention Romanian wine. We have some great vineyards, our own grape varieties and therefore our own wines, such as Fetească Albă, Fetească Neagră, Băbească Neagră, Grasă, Tămâioasă and others. 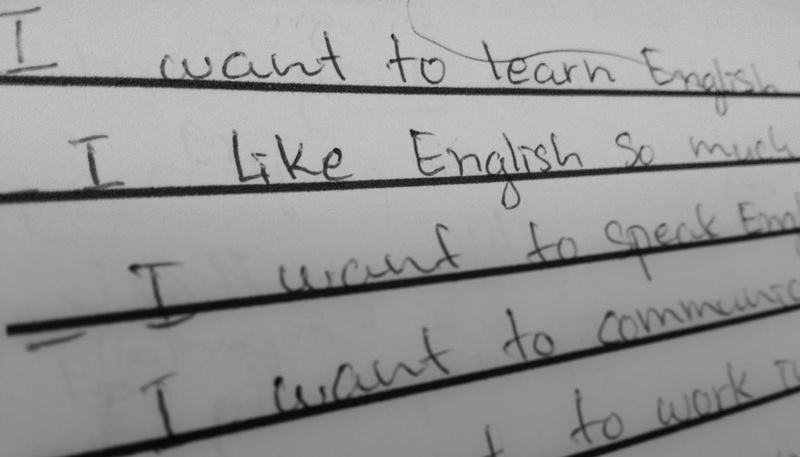 They are all worth trying. Wait a minute, was that cheese IN a sausage? When’s the next flight to Romania?! We head to Romania for a month in a few days. As a non meat eating carb hater….this could be tricky! Awesome. I am heading to Romania for the 1st time this fall. Looks like it’s going to be a hearty visit! Loved the cabbage rolls but I don’t think i would have the guts to try testicles. Or anything that supposed to be a body organ! You guys have to try covrigi next time you go! They’re donut-like rings usually filled with fruit but i always went for the chocolate.